No second-guessing, no hesitating, "Tap Dogs" is perfectly percussive, electrically energizing, and unabashedly manly. From ropes to scaffolding to power tools, these dogs growl with their legs and bite with their feet. No cats on this jagged stage and barely a word, just flannel shirts, tank tops, faded jeans, cut-offs and the occasional grunt. Putting six-inch stands to good use, microphones pick up the kick-ups only half a foot up (no pun intended). Save for one daring sequence in which they're duct-taped to the dancer's ankles. But that's only the tip of the creative saw blade; these tap dogs dance on a broken slanted stage, on water in rubber boots, and saddle-strapped upside down! 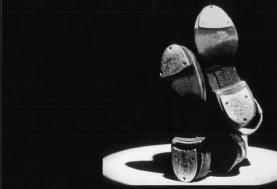 In one particular crowd-pleasing number, twelve tapping feet are visible under a one-foot crack between curtain and floor. Like Monty Python's dancing teeth and with impressive skill, they dangle as if attached in a mouth -- gleaming humor cracks upon that smile. Though most of the audio is comprised of sharp crisp hailing tap, some funk, techno and even heavy metal audio accompany. These six dogs tap their way over an electronic drum set triggering the floor pad sensors: Bass drum, snare, hi-hat, clap, whoop, and cowbell. Never letting the intensity wane until stage call, they construct the multi-level stage to industrial rhythms. Later, one dog dances with a basketball, tapping between dribbles. Though clocking in at a click over an hour twenty, this intermission-less presentation packs the punch of performances twice its duration. Rhythmic, meditational, exciting, rejuvenating, if you've got a headache stay home, otherwise you'll fall head over heels for "Tap Dogs." If you�re a fan of tap, you might also want to check out: Tap Kids. WIN a FREE signed book by Ross Anthony! Tap Dogs. Copyright © 2001. Performers: Sheldon Perry, Joshua Allan Cyr, Gregory Filler, Jeremy Fullam, Anthony Locascio, Ryan Gravelle, Billy Larson, Anthony Russo. Produced by Columbia Artists Theatricals (premieered in Sydney Austrialia in 1995). This live event review is based on the November 23, 2001 Pasadena Civic Auditorium performance.